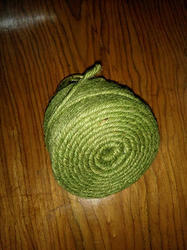 We can supply Jute Yarn in various lbs and ply started from 4.8 lb, 6 lb, 8lb, 9.5 lb, 10lb, 11 lb, 12 lb, 13 lb , 16 lb and 28 lb. In single ply or 2 ply or 3 ply. Each spool weight is 6 kg or 10 kg or 12 kg in precision wound. 6 such spool make truss, we can make in pallets. We are engaged in manufacturing a wide range of stylish Jute Fine Yarn. These are generally used for the purpose of weaving of jute carpets, mattings and rugs. Apart from these, the yarns are also playing an active role in applications like sewing, tying, packing pipe joints, cable binding, etc. Our range of Jute Fine Yarn is widely demanded by our clients, owing to their features of durability and excellent quality. 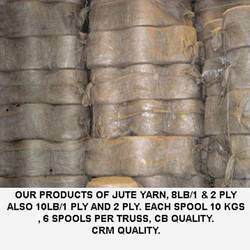 Avail from us an assortment of Packaging Jute Yarn. 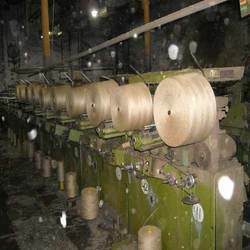 It is Jute Yarn 6 Spools Packing that is available in both customized and standard specifications. Known for their durability, strength and flexibility, these yarns are widely used in the manufacturing, knitting and weaving of sewing threads. 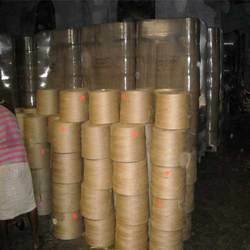 The range of Jute Yarn 6 Spools Packing offered by us is widely acknowledged in diverse industries due to its varied features. 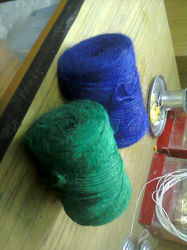 Colour Jute yarn 2 ply, 3 ply and 4 ply also. We are engaged in manufacturing and supplying a unique assortment of Jute Carpet Yarn. These are widely used by carpet manufacturer and other users, are generally available in bleached dyed and blended jute yarn. Offered at most competitive rates, these yarns are excellent insulator, and thus find extensive usage in construction and nursery. Our clients can avail them from us in best packing material.